À la mode means in fashion. 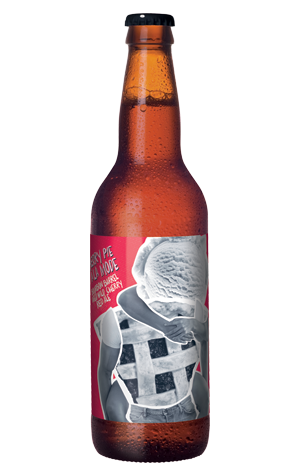 And quite why cherry pie is deemed as such by the experimental side of the Moon Dog brewing team we're not sure; maybe it's a nod to the US elections, what with cherry pie being the quintessential American pie, or maybe it's down to so many of the ingredients used within the brew – bourbon barrels, vanilla, fruit, Brettanomyces – becoming increasingly commonplace for brewers the world over. In the case of Cherry Pie À La Mode, the beer started out as a red ale built from various specialty malts, was fermented with the funky lambicus Brett strain and had cherries and vanilla added as well as spending three months in oak. As such a genesis suggests, the result is one with plenty to pick apart, from the vanilla and biscuity cake crust sweetness to the aggressive cherry cola flavours and spicy, dry and herbal finish. Taken together, you have a mashed in mashup of a beer.